I will be participating in this event. I am a wife, mom who likes to share everyday lifestyle topics and wouldn't mind getting my hands dirty to create any DIY. This is an inspirational event to learn, explore and have fun. At this event, you would be welcomed by HTGV magazine editor in chief Sara Peterson. Their guest speakers are Genevieve Gorder, Emily Bidwell, Sherry & John Petersik, Emily Henderson. You will have the opportunity to mingle and meet other bloggers and connect with the guest speakers. The 2nd Annual HGTV Magazine Blogger Party 2015 Event drew over 500 attendees, promotion & outreach. It generated over 5 million social impressions. Let's bond together and make 2016 HGTV Blogger Party triple the 5 million social impressions. For those of you who love watching HGTV. Who likes doing projects, crafts, DIY and design. 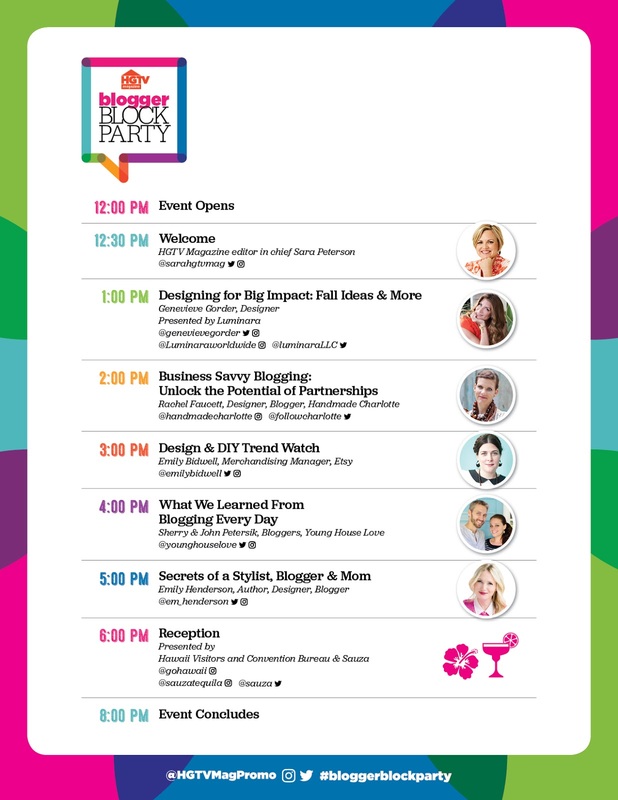 We have the awesome 3rd Annual HGTV Magazine Blogger Block Party. You will have the opportunity to be a part of this event. This event takes place in Manhattan, New York. Will you be in New York August 22nd? This event is free for anyone to join. You want to join RSVP here. I will see you there! HGTV Magazine sponsored this post. All opinions are 100% honest & completely my own. Ugh, I wish I was going to be in the city, but school starts here in CA next week, so we're locked in. This looks like it's going to be incredible! Fun, informative, creative, and networking. Have an amazing time! Oh what a great event. I so wish it was closer to me. We start school next week too. Those are some great guests. Cant wait to hear all about it. This Blogger Block Party looks like a great event. Wish I lived closer to New York City and I'd make sure to visit. I love all things DIY! Hope you have a great trip! This looks like it would be so much fun. Our school year has already started so I have no way to do this, but I hope you have fun and tell us all about it. I would love to be there, but there's no way I can make it. I'm looking forward to hearing all about it and I know you'll have a blast. This sounds like such an amazing event. There are going to be so many amazing bloggers and home design experts there. I would love to attend this event. Awww... too far! I wish I could attend, because I know this will be an awesome event and a chance to meet and collaborate with people who have the same interests as myself. Anyway, I wish you all the best! Have fun and keep us updated! This really looks like a great time. I am glad you shared and hope many attend that have a common interest. Just the word bash alone makes me want to attend! I love HGTV! 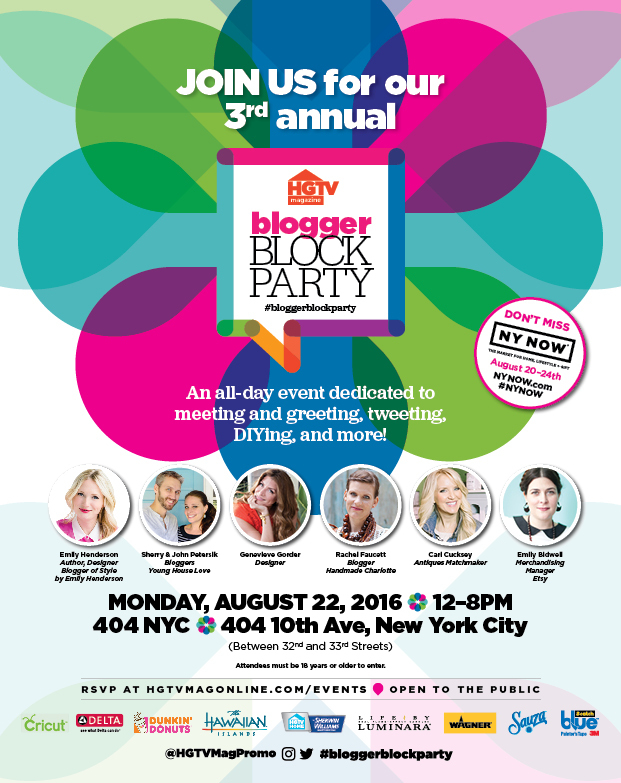 This Block Party for Bloggers sounds like it would be such a fun event to attend! What a great excuse to head to NYC!! I love watching HGTV and know that I would walk away from an experience like this with a ton of cool ideas. Looks like it will be a great time! HGTV is my fave! I can watch it all day! I would love to attend this event! Sounds fun! I love HGTV and would love to be part of this event! I would love to be a part of this exciting event. I'm a huge HGTV fan and have it going all the time. That event sounds fun and I'm really glad that you a part of it. This sounds like a great event for any blogger. I would love to go some day. It sounds like a great way to meet other bloggers and share great ideas. Thanks for sharing this Party. I have been looking for an excuse to return to NYC. This is it! I so wanted to attend this event, but I don't live in NYC. I would have come up but I'm coming up for Fashion Week so I didn't want to press my luck.